How Do You Make Your New Home's HVAC System More Energy Efficient? 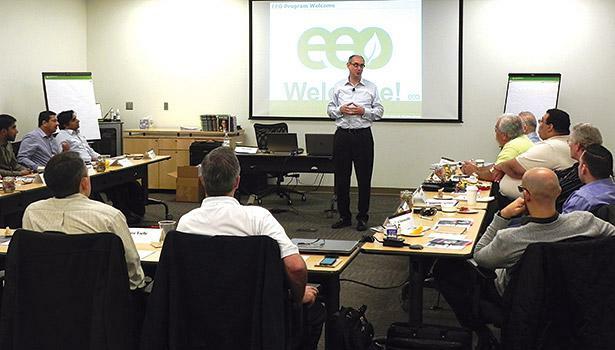 A lecture on increasing the energy efficiency of HVAC system. It is a part of the common knowledge that HVAC system is an essential and an inevitable item of each and every residential structure, from single family homes to institutions such as educational or health institutions, to business facilities. Since the society is struggling with economic problems and everyone, both common people and business persons, are constantly striving to save as much money as possible and to make sound investments, creating HVAC systems that are more energy efficient is a must. This is a statement on which everyone would undeniably agree. Besides taking care of saving money, people should also bear in mind that their responsibility is to preserve our precious environment that is alarmingly endangered, especially in the past few years or even decades. Having taken all these facts and statements into account, it appears obvious that finding ways to make new home’s HVAC system more energy efficient is supposed to be considered as the top challenge by all the business persons, and all the experts in general, who are engaged in the field of this system through either creating, producing, selling setting them up or restoring them. Nonetheless, business persons should be the first ones to recognize it as their challenge and therefore try hard to produce an HVAC system that will save both money and environment. This article aims to underline the most successful recently discovered way to achieve such a noble goal. Customers of the HVAC themselves should contribute to the usage of the system getting more efficient by following certain rules such as to change or clean the filters regularly, tune up the HVAC equipment every year, use natural lighting and other natural sources like moving air to control temperature, repair air leaks with a variety of materials such as expanding foam, etc. Nonetheless, business persons who title HVAC system as their field of work and expertise should definitely consider and take up certain techniques that will help them obtain more energy efficient systems. Besides, those who have undergone an HVAC training should also see developing HVAC systems the way they will become more efficient as their responsibility. It is not a secret that customers who use the HVAC system have noticed the examples of greater expenditures and reported them to the business persons engaged in the field. To clarify this, if the system is filtering the air from the outside and then warming it up or cooling it for space within the building, it makes the whole process quite expensive, and such an expenditure could be decreased by following certain steps for energy saving. An expert in the field, HPAC Engineering’s Hal Conick brought up the useful techniques of the company enVeird that might help HVAC system save energy through the program they created, which is called HLR (HVAC Load Reduction). What is the main benefit of this system? The benefit lays in the practice of using air that is already in the building, instead of taking up the expensive process of absorbing and filtering the air from the outdoors. In addition to that, HLR clears out the carbon dioxide as well as the organic gases from the inside of the building, thus providing the ones who use the facility with the constant circulation of fresh air. Returning to the fact that it uses the air from the indoors rather than absorbing the air from the outdoors, it might lead one to the conclusion that a system such as HLR is also extremely beneficial to the environment, as it does not waste extra sources. It would be interesting to explain more closely how the HLR system manages to get the indoors’ air back into circulation. Actually, it all seems quite simple – it is done by a special intelligent scrubber that appears to be quite efficient as well as eco-friendly. Nevertheless, applying such an energy saving system is useful but by no means easy. According to the specialist mentioned above, respected Hal Conic, HLR process is “easy to describe, but not easy to do” (Source: http://contractingbusiness.com/commercial-hvac/system-hopes-make-hvac-systems-more-efficient-less-expensive). What this expert stresses as the most difficult regarding the usage of HLR is the very fact that removing carbon dioxide from a building is an utterly complex process. He then claims that this gas is not easy to capture within a closed building without a great expenditure. Therefore, coming up with the idea and managing to produce a system such as HLR that provides HVAC system with a possibility to reduce the amount of the energy spent to absorb the air that will be heated and cooled within the facility is a remarkable challenge and a remarkable success. Although, according to Hal Conick, technology has so far not found many solutions for making HVAC system more efficient, cost-effective and eco-friendly and therefore business persons engaged in this field should take it as a challenge and strive to create more processes that resemble HLR in the future. Thus, more efficient practices such as this one will appear and improve the efficiency of HVAC system. Author: My name is Helena, I am a young student and also a creative and versatile writer. I am ambitious, witty and always up for challenges...as well as for new writing tasks!